Here are some mini programs that may be useful.. PureBasic source code is included. Vdrive detects removable drives like USB flash drives and memory cards, sets the environment variable VDRIVE, and launches an application. Of course, this will only be useful, if the launched application is aware of environment variables. For example, you may have a backup software or a CMD script that is configured to copy files to a USB drive. Though the paths and folders are fixed, the drive letter may change, or you may even have a choice of several removable drives. A target path like %vdrive%\Backup\John\Office will do the job. Vdrive is run through a shortcut with a command parameter that specifies the application path. You can also use %VDRIVE% in this application path to launch a program on the USB drive. Unicode support. Filedate FileDate offers a date picker to change the date (last written/modified). The time (of day) is taken from the original date/time stamp, and remains unchanged. FileDate expects one(!) file as command argument, and is designed as "Send to" tool (in the Explorer context menu). It also works by dropping the file on a FileDate shortcut. 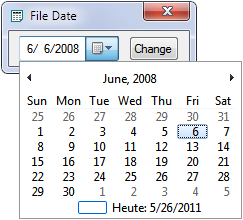 Date format according to the user's regional settings. Rename it to: "Qsel +some+where.exe"
The program name (without the ".exe" extension!) is placed at the beginning to make the shortcut easy to identify. Space separates from the directory information. Since the backslash character is not allowed in a file name, you have to use the plus (+) sign instead. ShortExe also treats single quote marks around the path as double quote marks (in case your path includes spaces). Command arguments are supported as well. 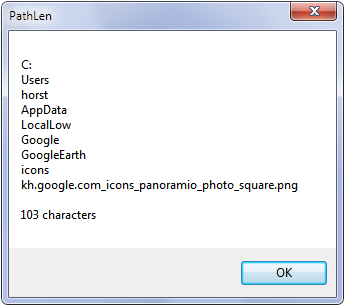 PathLen expects a path as parameter, and displays a message box with path information and length. If a directory path is given, the longest path in the structure is reported. Prompt to open the folder (Explorer window), or just an Ok button (by option). Unicode support. Make a shortcut on the desktop, and drag&drop any path from the Windows Explorer onto the shortcut. Or make a shortcut in your SendTo folder, and use context menu / SendTo. Note: The maximum path length that Windows can handle is 259 characters. If the initial path (parameter) is longer, Windows will fail to run PathLen. However, the longest path that is found may be longer, and will be reported. 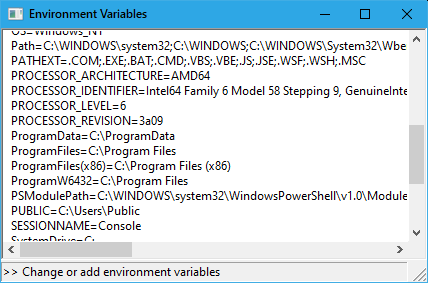 In a program that offers a launcher interface (like a programming editor) you can use EnvarList to see the variables that are available in this environment. Click in status bar will open the Windows tool to change or add environment variables. This program is a two-liner. PlayWav simply plays a WAV file without any user interface. The file is passed as command parameter. The program terminates itself. PlayWav is meant for small files. There is no way to stop it. Use in batch files, by drag&drop, thru "open with..", as "Send to" tool, or as default application for WAV.